FRANKFURT—European Central Bank President Mario Draghi faces a delicate balancing act on Thursday: reassuring investors that he can boost the ECB’s €1.7 trillion ($1.87 trillion) stimulus again but without revealing how he plans to do so. The ECB is expected to leave its policy mix unchanged for a fifth straight meeting this week, confirming it will continue to purchase €80 billion a month of mainly government bonds until at least March. Investors are increasingly nervous about what happens after that date. Many worry that, after years of unprecedented stimulus, the world’s central bankers are running out of tools to bolster growth and inflation. Senior ECB officials have indicated in recent days that they are increasingly alert to the downsides of their massive stimulus program, in particular the squeeze it has put on the European Union’s weak banks, which have struggled to pass on negative interest rates to customers. The central bank’s latest survey of bank lending, published on Tuesday, underlined that point, showing that subzero rates are squeezing banks’ profits. “The ECB is clearly facing ‘stimulus fatigue,’” said Gilles Moec, an economist with Bank of America Merrill Lynch in London. The ECB is “frustrated by the lack of support” from other authorities, including governments, and “probably more worried than it lets on about the long-term consequences of ultralow interest rates,” he said. Financial markets were rocked earlier this month by a report that the ECB could start to wind down, or taper, its so-called quantitative easing program soon. Despite a swift denial from Frankfurt, the yields on eurozone government bonds rose and have stayed higher. The ECB has been treading water since March, when it announced a sweeping set of measures aimed at bolstering the region’s economy, including additional bond purchases, fresh interest-rate cuts and cheap loans for banks. Policy makers hope those measures will reduce interest rates across the economy, thereby boosting lending, growth and inflation. But despite those measures, economic growth has remained tepid and inflation is still hovering around zero, far below the ECB’s target of just below 2%. Growth could slow further in the coming months as higher inflation rates weigh on real incomes, and a number of important European votes create uncertainty for investors, said Jonathan Loynes, an economist with Capital Economics in London. Most economists expect the ECB to extend its QE program by at least six months, a boost that would amount to around half a trillion euros of additional bond purchases. But any extension of QE would raise thorny political questions. 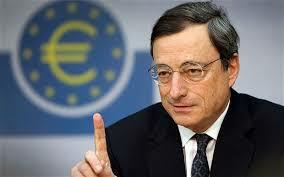 It would likely require a loosening of strict rules the ECB imposed on itself. Without such a relaxation, the ECB risks running out of bonds to buy. But loosening the rules could be seen as subsidizing particular governments. ECB staff are currently re-examining the design of the QE program, and are expected to deliver their results in December. Most economists expect the ECB to postpone any decision on QE until its policy meeting on Dec. 8, when ECB officials will also have fresh staff forecasts showing the likely path of inflation until 2019. Marchel Alexandrovich, an economist at Jefferies in London, estimates that the ECB will run out of German bunds in about two months unless it tweaks the rules of the program. Under those rules, the ECB is required to buy government bonds in proportion to the size of each economy, up to a limit of 33% of the total volume, and only bonds yielding more than minus 0.4%. In a paradox of financial markets, concerns over the future of QE have helped buy time for the ECB, because higher bond yields have pushed more German bunds into the pool of assets that are eligible for purchase. To be sure, policy makers have emphasized that they could adjust the parameters of the QE program at any time. But “in [the] absence of knowing exactly what to do [this week], Mr. Draghi will probably choose to do nothing,” said James Athey, fixed income manager at Aberdeen Asset Management PLC in London. By early December, there could also be greater clarity on the likely policy path of the U.S. Federal Reserve, as well as the outcome of a landmark Italian referendum on overhauls to the constitution, on which Prime Minister Matteo Renzi has staked his political future.